Did Sarah Huckabee Sanders Do the Right Thing? RUSH: This is Lisa in Highland, New York. Lisa, great to have you on the EIB Network. Hello. CALLER: Hi, Rush. Thank you for what you do. Yes. I’m from Highland, New York, and Highland Beach, Florida, not far from you. I want to make two quick points, if that’s okay. 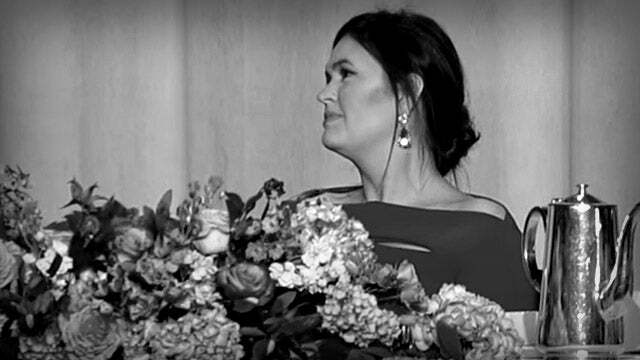 First, with regard to the scandal at the correspondents’ dinner, first of all, Sarah Huckabee Sanders is an amazing role model for women across this country. She sat there poised and beautiful, and she is definitely the epitome of resilience and strength and what feminism should be about. I am a successfully professional Christian married wife and mother and educated and retired at 50 from being a bank president and I consult and so many of my girlfriends across the country, I pulled at least 20 of us who were on the Trump train from day one because we took the books out of the library and read about Donald Trump. We studied him. We knew what he was going to do for our country, we are very smart, we totally get Economics 101, and we are still behind him. We knew we weren’t voting for an altar boy. We are proud of what he was able to accomplish. And we’re on the Trump train. Don’t ever believe the polls and that’s my first point. RUSH: Wait a minute. Let me ask. Hold it. Hold it. I need to ask you a question about Sarah Huckabee Sanders. RUSH: Because there’s a bit of contradiction out there. RUSH: Bback now to Lisa in Highland, New York. You said that Sarah Huckabee Sanders showed herself to be a role model for professional women. RUSH: I need to ask you a question about something, because we live in a culture where fighting back is rewarded. One of the reasons that Donald Trump is so loved and supported is that when people say things like that about him, it doesn’t take five minutes and he’s on Twitter burying them. Why is Sarah Huckabee Sanders being praised for sitting there stoically and not reacting and not walking out? Sitting there and taking it, not making a spectacle out of it, why is that garnering — and you’re not the only one. Maggie Haberman, New York Times, thought she was the success story of the night. How do you explain the difference here? RUSH: No, I’m not saying walk out. Get up and slap the hell out of the woman while she’s up there making the comments. CALLER: I think in that moment she did the best she could and she showed an amazing strength. You know, it doesn’t mean she’s not going to take questions on it today or tomorrow in a press conference, but certainly, you know, whatever happened to the old Michelle Obama statement, you know, when they go low, we go high or something to that effect. RUSH: Well, see, this is my point. And folks, I have tried never to become one of these old fuddy-duddy, you know, “get off my lawn” kind of people as I matured in life. And I can remember where the way Sarah Huckabee Sanders behaved on Saturday night was the way to do it. That was the classy way to do it. Do not give the provocateur the satisfaction of even showing you’re upset. Be bigger than the insult. Be bigger than the person throwing the mud. Do not walk out. Do not express anger. Do not confront the person afterwards. Sit there and be bigger. And that used to be universal. That was a standard way of dealing with it. Look. Let me make this personal. Back when this program started — and I’ve told versions of this story a number of times. My whole life nobody ever called me a racist, nobody ever thought I was, nobody thought was I hated anybody, nobody thought I was a bigot. But six months after doing this radio show I was all those. I became a racist, sexist, bigot, homophobe because the media was launching those salvos and those accusations every day. I understood it, but I still didn’t know how to deal with it. And I sought advice. How do I deal with this? And I had every bit of advice you could think. You can’t let that stand. You’ve got to fight back on that. You have got to make sure that doesn’t stick. Other people said, laugh it off. Don’t react to all this stuff, because all it’s gonna do is fuel ’em. And every bit of advice had its strengths and every bit of advice had its weaknesses. But the consensus view — and I’m talking 25 years ago — don’t let it be seen to bother you. Don’t react to it. You’ll only amplify it and make it big. Whatever you do, do not indicate it bothers you. That’s what Sarah Huckabee Sanders did, and she’s being universally praised for it, which I really dig. I really like it. But let’s face it. The culture today is different. And people who don’t fight back, the Republicans, for example, George W. Bush, Republicans in the House who don’t fight back against all of these slanderous allegations, their voters get frustrated and mad that they sit there and take it and that they don’t fight back against it. Donald Trump does, and he is rewarded with winning the presidency, for that and other reasons. So I just find it interesting that the standard good manners, classy way to deal with such a thing the way Sarah Sanders did it, that’s 25 years ago, she does it Saturday night is universally praised. And in the midst of a culture where pushing back, fighting back, not taking it, going to Twitter, going to Facebook, doing something to respond to it is also applauded. It’s a dichotomy. And it makes me wonder about the universality of ideals, the universality of good manners and the right thing to do as having been established over the long haul of human existence and human behavior. I mean, things are deemed to be classy for a reason. Things are deemed to be unclassy for a reason. Sarah Huckabee Sanders is being described as the epitome of class by practically everyone. I’m not including the low-rents on social media. I’m talking about people within her sphere. You know, even New York Times and Washington Post journalists are praising her for this. If she had fought back or if she had reacted, I wonder what kind of assessment that stratagem would have garnered. I gather not the same amount of respect that the way she dealt with it is getting. It just, to me, shows that the time-honored ways of dealing with fairly common occurrences in life still triumph. In other words, folks, it’s a really, really good sign that Sarah Huckabee Sanders’ behavior on Saturday in the face of all this was said to be classy and that the perp, the comedian, is the one that’s seen as in the gutter. RUSH: There’s a story here at Vox — haven’t read it yet — headline: Sarah Huckabee Sanders can dish it, but Republicans can’t take it. It’s a Millennial Vox reporter suggesting that Sarah Huckabee Sanders was no great thing, I think. Let me click on the link and find out what it actually says. VOX: Sarah Huckabee Sanders Can Dish It, But Republicans Can’t Take It.